When you talk about an “electric cycle,” most people mistake it for an e-scooter which is essentially a moped with an electric powertrain instead of an IC engine. However, in the case of an electric cycle, there’s more to this than meets the eye. The previous iterations of e-bikes usually came with an external battery and a hub motor which only provided pedal assist. 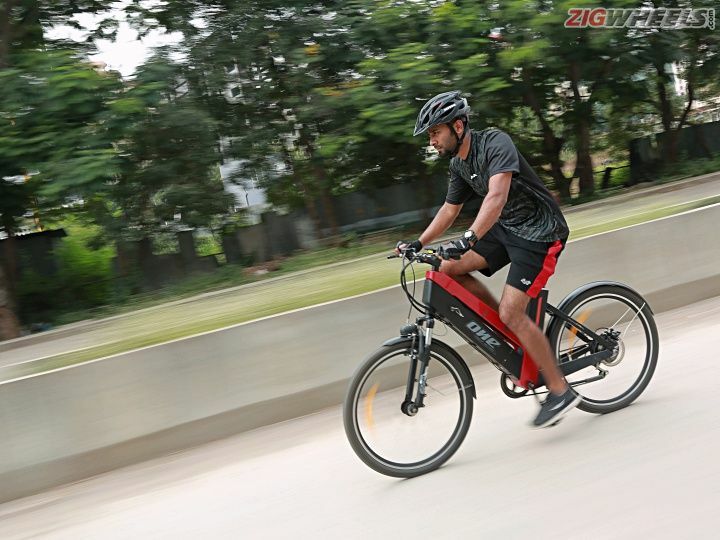 Now though, the recent instalments of e-bikes that have hit the market come with a battery onboard, an intuitive hub motor and an instrument console/module that lets you choose between different power modes and other options. Not only this, these cycles also feature a throttle which lets one putter around in city traffic without having to pedal. Exhibit A would be the Hero Ezephyr we tested over a month ago which looks eerily similar to the standard road bike, while exhibit B would be our most recent test e-bike, the Tronx One. It’s built by a company called Smartron which deals in electronics such as smart bands, phones, notebooks and more. The Tronx One promises to be a smart e-bike that can be an alternative to your daily commuter. So, does it live up to its claim? What the Tronx One really has going for it is the number of features it offers. A smart TFT screen with Bluetooth connectivity, app assistance, a removable battery pack along with a charging brick, a hub motor, storage area for essentials and a small yet effective LED headlight to illuminate your way at night. In terms of mechanicals, the cycle comes with 6-speed Shimano Tourney drivetrain system, Zoom MASERA front forks with 80mm of travel, a disk brake at the rear and a V-brake at the front for some odd reason. Its mid-step through frame makes it easy to get on and off the bike. As for visual appeal, it isn’t the most striking to look at but it does look interesting enough to make heads turn. The highlight for the Tronx is undoubtedly its feature-rich TFT screen. Quite literally speaking, it makes your everyday scooter’s instrument console feel antique. In addition, you have the option to connect your phone to the console via Bluetooth and keep track of everything that goes on with the bike. The phone app basically mimics all the information available on the console and backs it up for later reference. The user interface is easy to use as well, although we’d like to point out that we faced connectivity issues a couple of times while trying to sync our phone to the cycle console. Features on the console include a speedometer, odo, calorie count, travel time, battery information, average speed, max speed recorded, incoming call alerts, message alerts and time among others. On the downside, during our test rides during the monsoons, the TFT screen tended to fog up, rendering it unreadable in damp conditions. Other than the fogging issues though, the screen, backlit in white, is pretty bright even during daytime and all the information available is legible and well placed. Three buttons reside on the left-hand side and controls the entire interface on the TFT screen. You can toggle through three pages of information (basic information, cycling info summary and an ‘About’ page) quite easily using the ‘Mode’ button. When in the basic riding info page, you can toggle through the PAS (Pedal Assist) modes using the ‘plus’ and ‘minus’ buttons on the handlebars. PAS comprises of three modes depending on the amount of motor input one requires, 1 being the least intrusive and 3 being the most. Additionally, long pressing on the plus sign enables the front LED light; repeat it once again, and it switches off. The minus sign has a similar function; however, in this case, it activates ‘Walk Assist’ which lets you amble around on the cycle at a steady 5kmph. A pretty nifty feature in case of a flat tyre, where you would usually have to drag along the weight of the cycle. The 250W rear hub motor which does all the heavy lifting draws its power from the 36V 13.4Ah lithium 500W battery that resides in the bottom beam of the bicycle. Its Samsung-sourced battery, which is BIS (Bureau of Indian Standards) certified, has been further refined in-house by the manufacturer to meet the cycle’s desired specifications. The result is a hefty battery pack that can withstand temperatures varying from -4 degrees Celsius to 56 degrees Celsius while putting out an impressive range of a smidge over 50km purely on throttle mode. You can achieve a lot more using the pedal assist feature, which gives you just the right amount of boost from the electric motor when it senses strain on the pedal. To be honest, it seemed to go on for so long in this manner that we simply weren’t able to accurately range test it. And in our experience, we managed to fully charge the battery from empty in about 4-5 hours, though the company claims a slightly shorter time. An opening on the left-hand side of the bottom beam allows you to slide out the 500W removable battery. The panel gaps near the opening, though, can get a bit worrisome, especially during heavy downpours. An ignition key slot placed right above the battery panel also takes care of the locking mechanism. But you do need to fidget with the locking mechanism at times to pull the battery out. Although removing the battery pack is a practical option, the massive charging brick along with the battery can get a bit inconvenient to carry around. So if you want to use the Tronx on a long commute to work, it’s best to keep a spare charging brick at your office. Moreover, the charger’s cooling fan is quite loud for anyone’s liking. Nevertheless, the Tronx still deserves some brownie points for its practicality quotient. The cycle gets a thumb throttle instead of a twist-grip throttle, and it gets a little strenuous when used for longer durations. Also, when you push down on the throttle, there’s a slight delay before the motor kicks in. It doesn’t seem as intuitive either while using pedal assist. Not an alarming issue, but it’s a relevant one. At full throttle, the Tronx One can achieve speeds of about 22-23kmph and a little over 40kmph using pedal assist. While these are impressive speeds for a cycle, it also needs equally good brakes to get it to a standstill, and the rear disc paired with the front V-brake do a decent job at that. While we’re on the topic of brakes, we’d like to point out that the front end experiences a bit of a judder if you only use the front V-brake. Alternatively, you could get an optional front disc brake, which would undoubtedly improve the Tronx One’s braking abilities, but that does come at a premium of Rs 750. The stock tyres offer sufficient grip even in wet conditions. We had a chance to sample a couple of test bikes, and both of them had oil leaking from their front forks, which hampered the damping of the front suspension. Further hampering the ride quality are the narrow handlebars and cramped grips which takes a toll on your arms when riding for long durations. That said, the short handlebars make it easier to thread through narrow spaces and park in tight spots. On the plus side, the well-padded seat offers sufficient cushioning for your bottom, well, at least for average-sized ones like mine. The extensive use of plastic on the Tronx One comes with one disadvantage: It tends to rattle on rough roads and its durability seems questionable in the long run. Furthermore, the panels don’t leave any room to hold onto the cycle (25kg) while carrying it up a flight of stairs. Another issue we’d like to address is the locking mechanism for the battery, which has a tendency to play truant at times. There’s no quick release on the standard cycle for the seat and wheels either, so if you need to adjust the seat height or remove the tyres to fix a puncture, be prepared to visit your nearest cycle shop or have tools handy at all times. As for the 6-speed Shimano Tourney drivetrain system, well, it works just about fine we’d say. The derailleur, on the other hand, seemed to mis-shift at times and slotting it into 1st gear was next to impossible. It’s quite possible that the test unit we had was faulty, so we’ll reserve judgement on that. The Tronx One could also do with a seventh cog as the 6-speed drivetrain feels a bit lacking on downslopes or when you need to hit high speeds on straight roads. Everything said and done, the most prominent problem with the cycle is the part where the left pedal hits the side stand when parked. So, if your chain comes loose and you try to reel it into position, you can’t, because every time you rotate the pedal to align the chain, the stand intervenes with the pedal. Even with all these equipment, the One’s price tag of Rs 54,999 feels quite steep to be honest. However, the manufacturer justifies the price by stating that each charge of the Tronx One consumes only one unit of electricity, which roughly translates to a little under 10 bucks. This means you end up paying around 7 paise for every 1km you travel, which on the face of it sounds really impressive. The bikemaker also offers 1 year replacement warranty for all electricals and claims they can rectify any major issues with the cycle within 2 days. All in all, it's a decent proposition for beginner cyclists who wouldn’t want to overexert themselves while trying to stay fit, but also save some money in the long run. However, we believe that in terms of pricing, the Tronx One is a bit of a stretch, especially when you look at alternatives in the market such as Hero Electric's Ozone 26T and Ozone 650B, priced at Rs 44,900 and Rs 45,490 respectively. Sure, these electric cycles do offer a little less range (approx 30km per charge) but make up for that with better quality. That said, as far as we know, and have tested, the Tronx One really is the champion among e-bicycles when it comes to going the distance. Here’s a list of accessories for the Tronx One.